Bamboo has a high density of 0.789 which is higher than birches of 0.615 and oak of 0.742. Its bending strength and tension resistence is twice of ordinary trees. and this makes it very environmental friendly. *Natural moso bamboo material,with elegant and artistic apperance,beautifies your room. *Paint by varnish,pollution free,mothproof,no burr,non-deformed and anti-crack. *Hanging design.The top with a beam to hang plant or cloth. *Assembly and folding.After right assemble,the rack could be folded. Quality: Made by 100% natural bamboo of high mountain;sterilized by high temperature and high pressure;processed by carbonization,solid and durable. 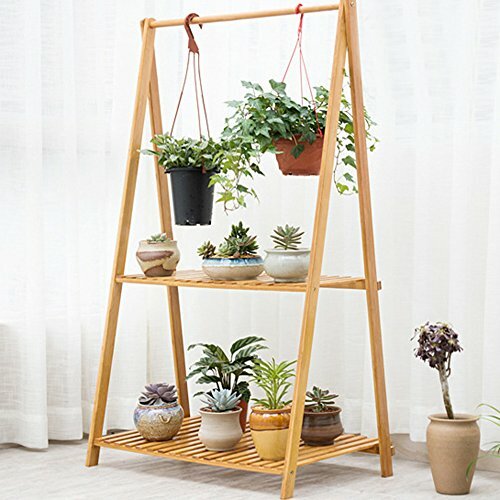 Function: Multi-functional,it could be used as flower rack,plant shelf,bonsai stand and cloth storage shelf in living room,balcony,even in your garden and rooftop. Technic: Folding and hanging design,enough space from top beam to first layer for plant or cloth hanging. Assemble Instructions Included: Assembly design, need be assembled by yourself. Screw and Allen key included. You could install it as enclosed instructions. If you have any questions about this product by Cyanbamboo, contact us by completing and submitting the form below. If you are looking for a specif part number, please include it with your message.